LINES will help you save time and money during your Universal Orlando trip. Because we’re independent travel writers, we can tell you what Universal can’t, from actual waits in line, to which park will be less crowded every day of your trip. LINES features include: -Both Universal’s currently posted wait time at every attraction and how long you’ll REALLY wait in line, based on our experience and that of thousands of families on the same ride. 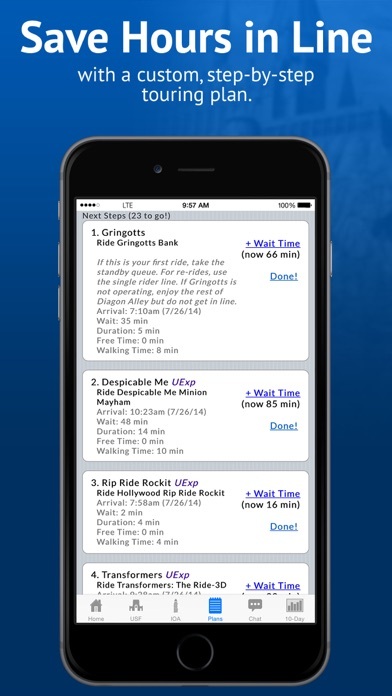 -New “Ride Now” and “Wait to Ride” recommendations to show whether waits are going up or down at your favorite rides. -Customized step-by-step touring plans for both Universal Studios Florida and Islands of Adventure parks, including The Wizarding World of Harry Potter areas. You tell LINES which rides you want to see, and LINES will create a step-by-step itinerary showing when to go to each ride to avoid long lines. You can even change your plans while you’re in the park! -A Crowd Calendar showing you how busy each park will be over the next ten days. 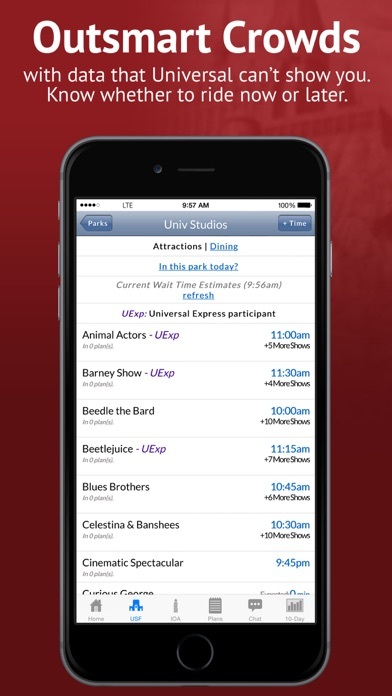 -Universal’s official app doesn’t show you the waits for many attractions or character greetings. LINES has wait times for more rides, shows, and character greetings than even Universal’s own app. -Ask questions and get fast answers from our online community of 120,000 theme park experts. -Menus and prices for every restaurant, kiosk, food stand, and cart in all of Universal Orlando Resort – more than 4,500 things to eat! Every menu is searchable – you can find every steak in Islands of Adventure or throughout the parks, CityWalk, and the official Universal Orlando Resort Hotels! Our theme park trip planning tools have been featured in USA Today, the New York Times, FOX News and dozens of other newspapers, magazines, television and radio shows. Since 1986, we’ve helped more than 3 million families plan their vacations. Note: Some LINES features, such as the crowd calendar and wait times, require an in-app subscription purchase to access. 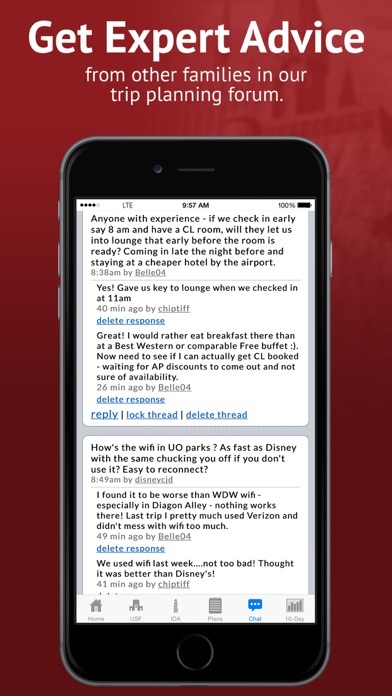 Other LINES features, such as customized touring plans, menus, and viewing chat forums, are completely free. Your in-app subscription includes 365 days of access to TouringPlans.com, the Web’s most popular subscription-based site for theme park trip planning. I decided to try this app on a whim and have not regretted it for a moment. As someone who has almost no paid apps, a $7 purchase was a stretch, but I now strongly recommend this app to anyone I know going to universal. The wait times are accurate (and includes single rider wait times), and maybe the most useful feature (that official Universal apps don’t offer) is the wait time “forecast” for later in the day (ex. “30 minute wait for Spider-Man right now; will be shorter after 5pm”) which is super useful for planning what you want to ride next and whether a longer wait is worthwhile. It’s important to note: I am NOT a theme park “hacker” who is trying to maximize every single minute of every visit. I just like to enjoy the parks at my own pace and I still find this app very useful for guiding my visit. Great app for happy vacations! I have used this app at Disney World and Universal. I love that we can put in what rides we want to go on and how many times we want to ride them and then the app optimizes a plan for us. I love that it adjusts based on crowd levels, so we have an accurate plan. I love that it gives us a sense of what is possible and what is really not possible. I love that I can customize the plan and save multiple versions of the same day. I love that, mid-day, we can change our plans, and spend 5 minutes running scenarios through the app to see which order gets us the most optimized day. I love that it allows the flexibility to choose walking speeds so we can adjust for when my husband is taking the kids around or my elderly parents (or my disabled self) are joining the fun. This app has left us feeling that we got the absolute most out of our vacation, so it has contributed to our overall satisfaction and relaxation. Wait time in app were incorrect. Most plan not covering all best rides. Not worth of money better use Universal studio app. Used this for Magic Kingdom, Animal Kingdom, Universal Studios Orlando, and Islands of Adventure. Got behind at Magic Kingdom because rides closed, but overall kept on track or slightly ahead. Used A different program several years ago for Disneyland and was happy with that. This one works just as well. Would recommend. If you’re looking to visit US & IOA on slow days based on this apps “dynamic and proprietary” info and intel - don’t. I’ll stick with Undercover Tourist because this apps crowd predictions were off 4 out of 4 recent visits. I recommend everyone start their vacation planning with Touring Plans and the Unofficial Guides. Absolutely invaluable for reviews, descriptions, and of course, saving time with Plans. So much info in the palm of your hands! 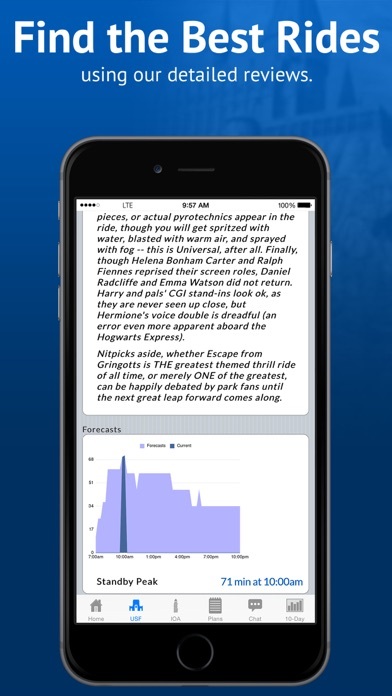 Crowd predictions, park hours, menus, wait times, and very knowledgeable folks on the chat feature who can answer all manner of destination questions. Love it! We used this site for 5 days at WDW parks 3 years ago and I just purchased again for our trip to UOR. I have never been an organized person, but this made planning so easy and it allowed us to do every single ride we wanted. It had everything planned for us down to the minute, but it could easily be changed by optimizing the plan at any time with the push of one button on my phone. I want something like this for all my vacations! We definitely got the most out of our vacation even with 4 kids from ages 2-13 at the time.